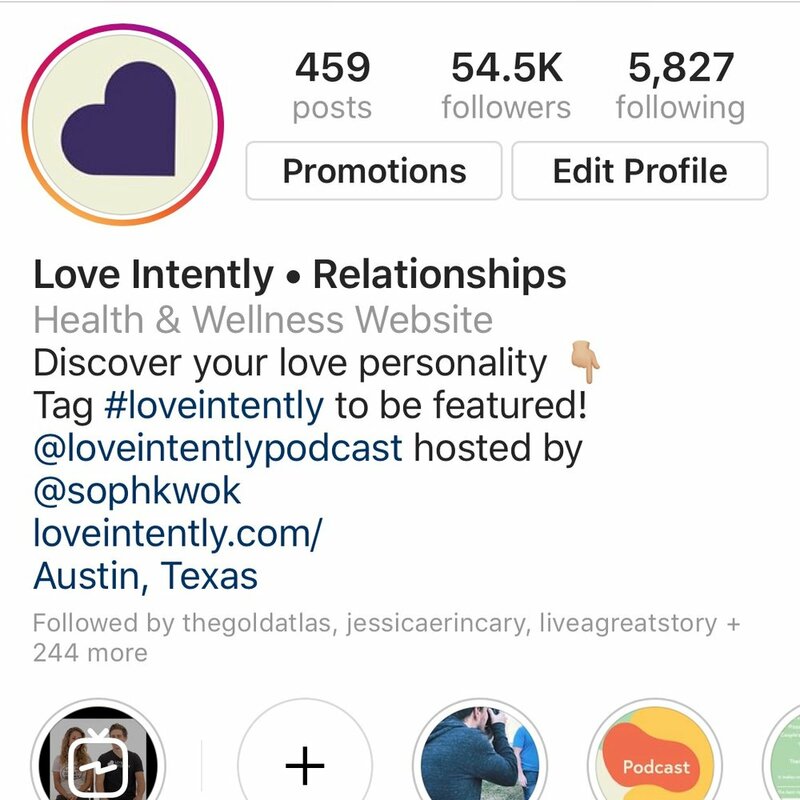 Love Intently has been featured in Austin Business Journal, Austin Women, and Tech Co.
Love Intently launched a podcast and featured NTY best sellers and Influencers with over 500k followers. I have been asked to share Love Intently’s founder story on 12+ different including Redbull’s Amaphiko, Woke Beauty’s SXSW event. We were nominated as Top 100 Startups of the Year in 2018 by Tech Co.
Meg McLaughlin, Sarah Lum, and I utilized design and ethnographic research methods to learn about second-generation Asian Americans and their lives. We cooked with them their homes, heard stories about their families through artifacts, and listened to phone calls between themselves and their parents. We utilized cooking as a method to place ourselves in the role of a novice. As students, we were able to build rapport quickly and dive deeper into topics outside of their ordinary everyday topics. Our goal was to learn about the influence of family and cultural dynamics in the lives of young adults whose parents immigrated to the US. 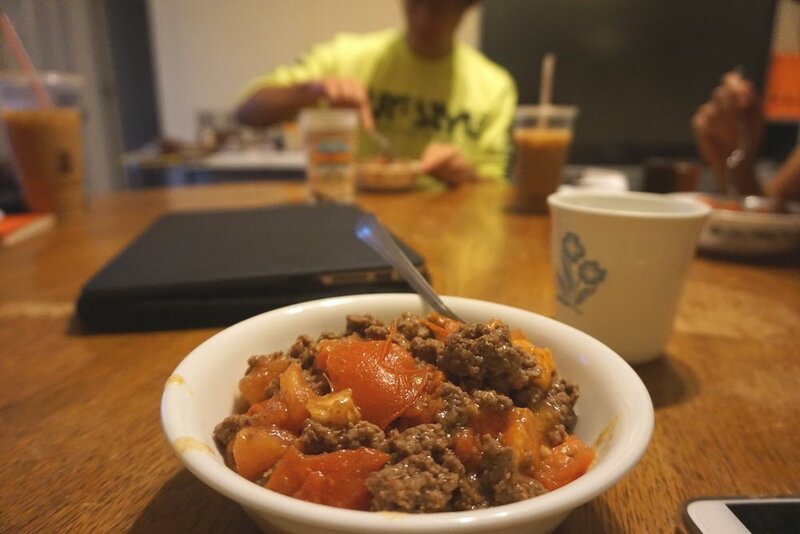 On average, we spent about 2.5 hours in the home of each participant. Although, our participants shared unfathomable stories of difficulty; many of them thanked us for our time with them as they rarely get the opportunity to share their lives openly. Sarah and Meg in Lili's home. Lili was still living with her mom and we were able to see artifacts from her entire childhood and pieces of Vietnam throughout their home. Hana’s parents just moved to the Philippine's to retire. This recipe book is a family heirloom she has been able to hold on to. Arthur showing us a comic his sister made. Arthur and his only sister lost both of his parents. He shared their stories of immigrating to America from a boat. He shared how he has slowly collected more of his parents stories from their siblings over the years since their passing. Gabe reconnecting with his mom. This call was first time he spoke to her in months since their last fight. During the call, she shared stories of hiding in the closet and losing family members during the Cambodian genocide to the Khmer Rouge. David was about to graduate college and shared his story of secretly seeking therapy to get out of depression. He didn’t tell his family till much later because he felt it was taboo. After all of our interviews, we looked for patterns and started synthesizing the data to form into insights. Based on our research, we created guiding design principles and insights to lead us forward. Feel that they have no reason to speak up because their problems are incomparable to the trauma their parents went through. Avoid confrontation because they fear losing control, but they’re losing more by not addressing their frustrations. Conflict was rarely a lack of love, but a lack of understanding. Build space for imperfection by creating tools to share shortcomings safely. Encourage personal acknowledgment that validates self-worth. Our team spent a week ideating different ideas. Based on our design criteria, we decided to move forward with an app that would provide tools for healthy conflict resolution. First, we story boarded the idea and scenarios. We went through rapid ideation and iterated on different user flows. We tested with users and gathered feedback. After a few weeks of testing, we found family dynamics can be intricate and complex. Often, after a certain age, many of our participants rarely lived in the same city as their family, thus lowering the desire to approach the conflict. 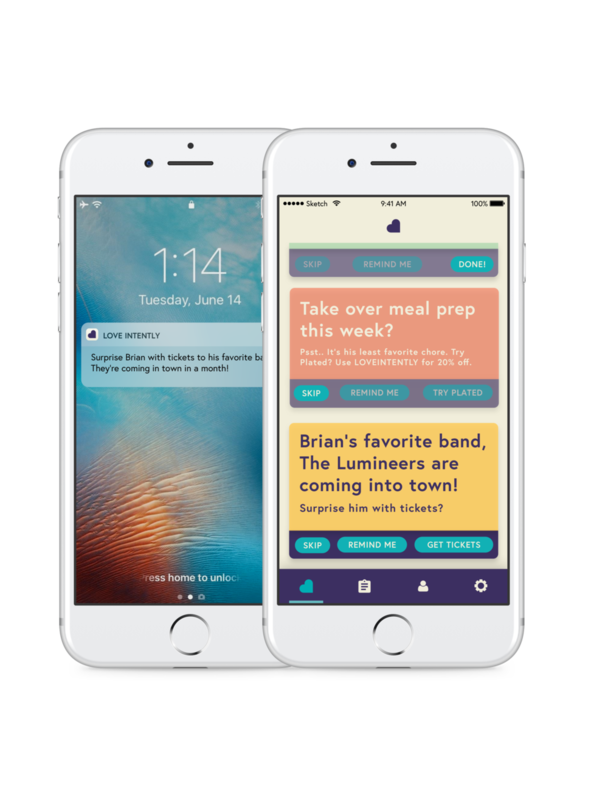 However, the more we user tested and explored familial relationships, the more apparent the app was not getting to the heart of their conflicts. Users testing the app wanted specific applicable advice unique to their problems. As conflict and family dynamics holds intricate complexity and variables, our prompts fell short. Ultimately, we knew we needed to pivot. Entering our last quarter at AC4D, we revisited our research and refined the concept to focus on a specific type of conflict. We found many of the conflicts our participants spoke about with their family also appeared in their romantic relationships. Additionally, we recognized that they were more proactive and hopeful in their romantic relationships. Based on our learnings from the Elephant in the Room, we knew to be successful; we would empower both partners understand and communicate their motivations and feelings. Additionally, we recognized that a proactive solution rather than reactive would be far more effective. We shifted to focusing on developing healthier relationships from the beginning rather than fixing relationships after conflict arose. As we improved their relationship with their romantic partner, it would enhance their ability to communicate in other aspects of their lives as well. These conclusions led us to create Openly. Relationships are the most important yet under supported part of our lives. We all enter relationships with conscious or unconscious expectations for our partners in a relationship. Many times, those expectations go unsaid, leading to misunderstandings that leave both of us hurt or disappointed. Books and events help us understand healthy communication frameworks but implementation is much more difficult. Voicing your expectations in a relationship is vulnerable. It can feel selfish to ask for what you want. Continuously showing your partner you care in a way they understand daily is an evolving, learned skill. Kim has been married to her husband Brian for a little over a year. She told us that were arguing a lot lately. There arguments were mostly because he works long hours at as a restaurant manager, and she doesn't get to spend as much time with him as she would like. Kim feels like she's nagging him all the time, and can't stop herself. She doesn't know what's going on inside his head. We met Kim during research, she and her husband, Brian were one of three couples that we tested Openly with. The first thing Kim and Brian did with Openly was take a simple, friendly quiz to determine how they love and communicate uniquely. Kim learned that she best understands love through Words, and Brian feels loved through Touch. The results from this quiz influence the suggestions each partner receives. We were inspired by the Five Love Languages as a philosophy however, the framework wasn’t tangible and required significant guesswork for our users to actually implement. What does it actually mean each day when your partner is words of affirmation? The Be Here section is where users will look at to view their daily LoveTips ( aka suggestions). Users set the frequency of LoveTips to do something special for their partners. The first time using Openly, Kim uses this section to connect to Brian and take the first quiz. In this section, Kim enters a custom suggestion for Brian to “plan a weekend getaway” that then translates and saves in the “My Ideas” section. Here Kim can compare her quiz results to Brian’s. The quizzes act as the brain of the app, influencing their Love Personality and how we interact with each of the users. After AC4D, I got the opportunity to continue building Love Intently while Meg decided to pursue a UX design position. Based on our learnings, I put together a pilot program and got couples to sign up. 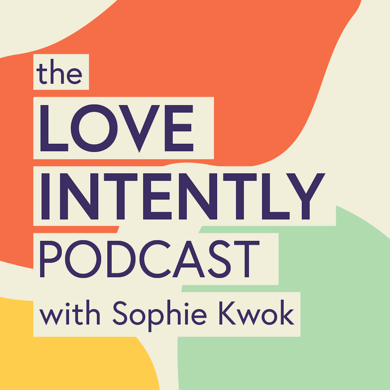 Openly was rebranded to Love Intently due to an existing trademark. My main focus was on building an audience, a team, and continuing to validate the idea through a paid pilot. I wanted to learn, what would couples do after using Love Intently for extended periods of time. We acquired a 20% conversion to paying users with our Alpha. However, our solution wasn’t scalable, thus requiring further development to bring our solution to scale. The team at the time and I tested with a web application and SMS, but ultimately knew a mobile app would provide the optimal user experience. Primarily, couples visit the LoveTips page for daily tips to empower their relationship. Here they are able to set reminders or skip the LoveTips. The users answers to the quizzes help build on a user’s Love Personality. 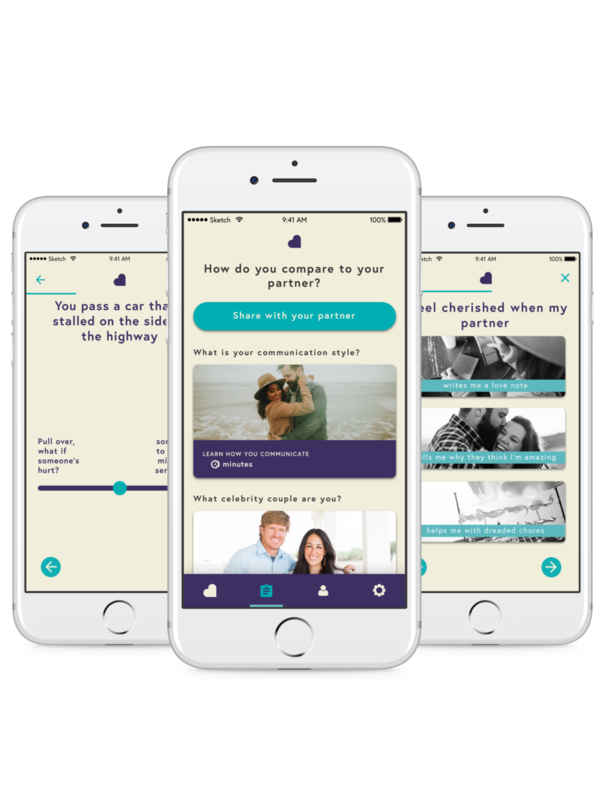 Users are able to compare their Love Personality to their partners. The more they use Love Intently the better their LoveTips will be. Collectively, Love Intently has served over 1k users to date. After months of testing, we found a much higher engagement with SMS. We found this to be a trend within the industry at large, SMS has a 90% open rate, while notifications are easily drowned out. 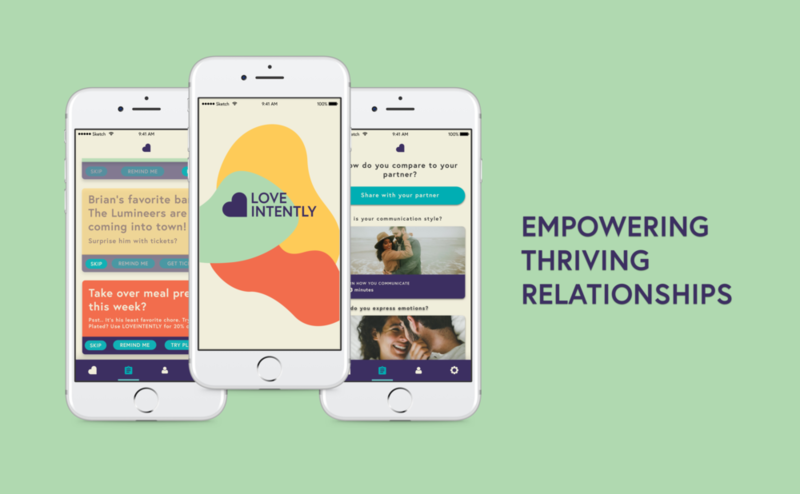 Love Intently has since removed our app from the IOS App store. We tested content and gathered insights via an SMS and web application initially. Only a portion of the application was built out due to lack of funding. Feel free to ask me more about my learnings or for additional wireframes. Design Research, Conceptualizing, Wire-framing, Prototyping, Usability testing, Branding, Pitching, and Marketing Strategy. Sketch App, Illustrator, Keynote, InVision, and Zeplin.